The Great Northern bar was situated at the gushet of Cowcaddens and Stewart Street. 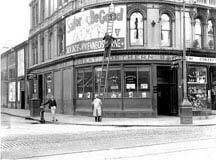 To read more on the history of this popular Cowcaddens pub Click here. Also see the George Bar.